paul...a true follower of jesus or a subverter of the faith of jesus and founder of a new religion? 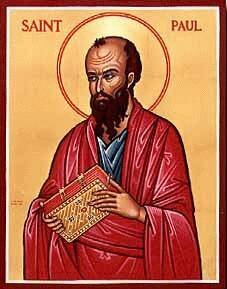 PAUL...TRUE FOLLOWER OF JESUS...OR SUBVERTER OF THE FAITH OF JESUS AND FOUNDER OF A NEW RELIGION? When reading this website one will come into much challenging information that will be completely new to the seeker of truth. I assure you that the following details, facts, and information concerning the true historical Paul and the problem and the split with the Jerusalem Church is documented well outside the New Testament. I challenge every reader to do his own "homework" in order to verify to himself beyond any doubt that what I will be sharing with you is the truth and in order to make it easy for you I have presented a short bibliography where you can verify the facts in this website for yourself from the following scholarly sources. Historical Statements About The Apostle Paul...How Can They Say Such Things About Paul...What Do They Know That We Don't? The Gospel Message Of Jesus And Paul...Do They Agree? The Gospel Message of Jesus...Who Will You Believe For Eternal Life...Jesus Or Paul? The Gospel Message of Paul...Who Will You Believe For Eternal Life...Paul or Jesus? The Nature Of The Christian Faith: Historical Or Mythical? Does Paul's De-Emphasis Upon The Human Jesus Affect The Writers Of The Other Gospels? Solving The Jesus-Paul Problem...Can It Be Done? THE PICTURE OF PAUL IN THE NEW TESTAMENT: HAVE WE BEEN TAUGHT THE TRUTH? The Picture Of Paul In The New Testament...Have We Been Taught The Truth? The Problem Of Paul In The New Testament...But You Never Knew That There Was A Problem...Did You? Can Knowledge Of The Pharisees, Gamaliel, Stephen, And Paul's Pre-Christian Life Help Us Find The Truth? The Non-Jewish Ideas Of Paul---A Pharisee of Pharisees...How Can This Be? Does The Account Of The Jerusalem Church In The Book Of Acts Discount Paul's "Gospel" And Theology? Controvery At The Jerusalem Council? Law Or Grace? Or Both? Paul...He Was Opposed By The Nazarenes And Yeshua's Church...This Should Trouble You! Paul's Conversion In The New Testament...Is It Trustworthy...Or Should We Be Suspicious? Did Paul Betray Yeshua And His Message? When Paul's Teachings Conflict With Jesus...Who Are We To Believe? The Law According To Paul...How Can We Believe Him? Does Paul Have Double Vision When It Comes To The Law? Did Paul Continue To Bring Blood Sacrifices After The Cross Of Jesus? In Spite Of Paul's Favorite Portrayal In The New Testament...Was He Still An Enemy Of The Faith Of Jesus? Paul And The Nazarenes...Why Do Their Messages Conflict When They Both Followed Yeshua? What Is This Law That Paul Rejected? The Law According To Paul...Can We Believe Him? Paul's Conflicting Ideas On The Law...What Gives? Faith And Works...Does Paul Misrepresent It In The New Testament? Paul Would Have Us Believe Grace Is "Mysteriously" Somehow Exclusive Of Good Works...Is It? Grace As God's Unmerited Favor...Or Is It Merited After All....And Again Have We Been Misled By Paul? The Anti-Judaism Of Paul...Strange For A Pharisee Of Pharisees...Don't You Think? Paul Misquotes The Prophets And Misinterprets The Cornerstone...You Have Got To Be Kidding? Does God Want You To Obey His Torah Or Paul For Salvation? Does Paul Have The Right To Say That Those Who Don't Accept His "Variant" Gospel Are No Longer The Israel Of God? Is God's Wisdom Available To All Or Only To Those Who Accept His "Variant" Gospel? How Could Paul Be So Wrong In Saying Hanging A Corpse On A Tree Is A Curse On The Dead Instead Of The Living? Does Paul Try To Make Us Believe That Abraham Alluded To Jesus When He Didn't? Faith Or Deeds? Did Paul Misrepresent Abraham And David In His Writings...And What Are We To Believe? Did Paul Misapply The Text Of Isaiah To Maliciously Accuse The Jews Of Blaspheming The Name Of God...When They Had Not? Does Paul Slant The Truth To Make It Look Like His Pauline Christianity Has Replaced The Religion Of Moses And Yeshua? Does Paul Take Out Of Context The Psalms To Make His Point...Even If The Original Author Of The Psalms Intended No Such Meaning? Did The Writers Of Gal. 3:5-6 Take The Quote Of Abraham And Faith From Gen. 15:6 Completely Out Of Context? "In Thee Shall All The Nations Be Blessed"...What Does This Really Mean? Galatians 3:11...No Man Is Justified By Obedience To The Law In The Sight Of God...Or Is He? Galatians 3:13...How Could Paul Be So Wrong In Teaching That The Hanging Of A Corpse On A Tree Is A Curse Upon The "Dead" Instead Of The "Living"? Galatians 3:19 States That "The Law Was Ordained By Angels" Or Was It? Galatians 3:19 States That The Law Was Given Because Of Transgressions...Was It #1? Galatians 3:19 States That The Law Was Given Because Of Transgressions...Was It #2? Isa. 54:1 & Sarah And Hagar...Paul's Attempt To Teach With Rabbinic Methods...Gone Completely Awry! "In Thee Shall All The Nations Be Blessed"...Does This Refer To Jesus As Paul Would Have Us Believe? Paul Would Have You Believe That Gentiles Who Accept His Unique Gospel Are Now The "New Israel"...How Absurd Paul! Can Paul Misquote Habakkuk And Get Away With It? Well He Has! Did The New Testament Writers Deceptively Picture Biblical Judaism As A Religion Without Love? Paul's Rebuke Of Peter....Have We Misunderstood What Really Happened At The Antioch Incident #1? Paul's Rebuke Of Peter....Have We Misunderstood What Really Happened At The Antioch Incident #2? Paul's Rebuke Of Peter....Have We Misunderstood What Really Happened At The Antioch Incident #3? Paul's Rebuke Of Peter....Have We Misunderstood What Really Happened At The Antioch Incident #4? Paul's Rebuke Of Peter....Have We Misunderstood What Really Happened At The Antioch Incident #5? Paul's Rebuke Of Peter....Have We Misunderstood What Really Happened At The Antioch Incident #6? Paul's Rebuke Of Peter....Have We Misunderstood What Really Happened At The Antioch Incident #7? Paul's Rebuke Of Peter....Have We Misunderstood What Really Happened At The Antioch Incident #8? Paul's Rebuke Of Peter....Have We Misunderstood What Really Happened At The Antioch Incident #9? Paul's Rebuke Of Peter....Have We Misunderstood What Really Happened At The Antioch Incident #10? Paul's Rebuke Of Peter....Have We Misunderstood What Really Happened At The Antioch Incident #11? Paul's Rebuke Of Peter....Have We Misunderstood What Really Happened At The Antioch Incident #12? CONTRASTNG THE TEACHINGS OF JESUS AGAINST THE TEACHINGS OF PAUL...WHY DOES PAUL DISAGREE WITH JESUS' MESSAGE AND GOSPEL? As we conclude the study of apostolic theology, the words of Rabbi Solomon Schechter come to mind: "One thing is quite clear even to every student, and this is that a curious alternative is always haunting our exegesis of the Epistles. Either the theology of the Rabbis must be wrong, its conception of God debasing, its leading motives materialistic and coarse, its teachings lacking in enthusiasm and spirituality, or the Apostle to the Gentiles is quite unintelligible." Paul And His Heretical Views On Authority....Was He A Sexist? Paul And His Views Of Jewish Christians...What Would Jesus Think Of This? Who Is The Real Paul...A Man Of Tolerance Or Bigotry? Who Were The Evangelists And Why Did They Write What They Did? Have We Believed In "Another Jesus" And Not Known It? Have We Completely Misunderstood Paul's Message In The Book Of Galatians No.1? Have We Completely Misunderstood Paul's Message In The Book Of Galatians No.2? Have We Completely Misunderstood Paul's Message In The Book Of Galatians No.3? Have We Completely Misunderstood Paul's Message In The Book Of Galatians No.4?